Jaded, if you search on “Search Within Thread” > Author, you will see that this is your first post listed there. Is that so? I’ve been away for some time. I really can’t remember, but no matter…Better late than never, I guess. You’re still on time to catch this “train”, don’t worry Welcome back! I am interested in two of these. You’ll see your name on the next update. BLING BLING BLUE BLING ! 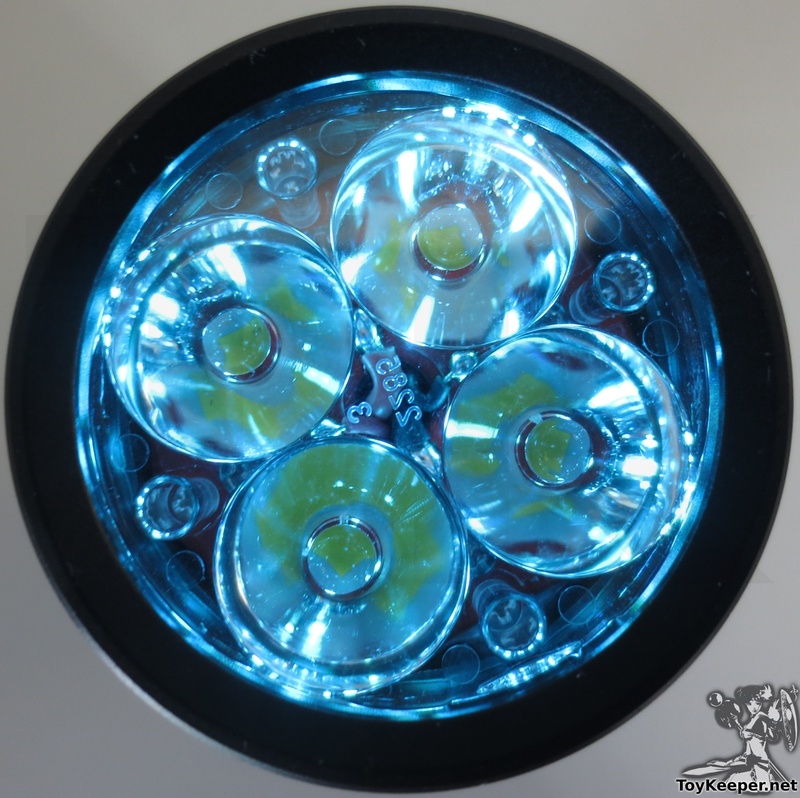 After reading the preliminary report of the soon to be released upgraded Emisar D4S, I’m absolutely thrilled at the addition of the BLUE “find me” marker LEDs surrounding the main LEDs. Since tritium is so expensive, GITD fades so quickly, would it be feasible to copycat/incorporate the blue marker design inside the head of the FW3A? To easily locate the light in dark conditions? BLING BLING BLING BLING CYAN BLING ! After reading the preliminary report of the soon to be released D4S, I’m absolutely thrilled at the addition of the cyan “find me” marker LEDs surrounding the main LEDs. Since tritium is so expensive, GITD fades so quickly, would it be feasible to copycat/incorporate the cyan marker design inside the head of the FW3A? I would die happy (hopefully) if it were a possibility…. Can you explain what your refering to? Maybe a link? The blue LEDs of the Emisar D4S, I guess! the Blue (look cyan to my eye) “auxiliary” LEDs inside the Emisar D4S! It’s a fantastic idea IMHO. Similar in concept to a lighted tailcap switch, an always-on option for locating the light in the dark. First much gratitude and respect for your active (leadership) role in a diversity of projects here. IMHO you are a strong and valued asset to the BLF community and deserve recognition as such. I applaud your contributions and efforts. I’m very grateful for MascaratumB for catching my reference, otherwise the point of my post would have been missed. Emisar added 2 major design elements to their evolutionary upgrade from the D4 to the D4S, most notably the BLUE marker always on find me LEDs inside the head and a larger body to incorporate a huge 26650 cell in place of the D4 18650 cell. Thank you for all that you have done, and continue to do for the BLF community. Thanks. Been around CPF for … a long time … and happened across this a few weeks ago, finally signing up. Cool. Got a feel for how volunteer efforts go so I’m patient. Already mid-August and this light still isn’t ready for production. I wonder if these will ship before the end of the year. Seems to be awfully slow. Sho nuff, but Lumintop has been pretty busy. They recently released the ODF30, the ODL20C, GT Mini and GT70. I’m guessing they may not have a lot of resources right now to work on the FW3A. It seems like once they devote some people to it, the project is capable of moving very quickly. We are approaching the busy season in China. I also hope we can get these lights this year. I do see they have to match the competition of other brands, but…almost 2000 units (despite it’s cheap price) must mean something!! I am sure that the hundred thousands of people that participates on forums and watches YouTube flashlight’s reviews would be interested in having something like the FW3A! Used to work for a small manufacturer as a designer. We did short runs of our parts in house – mostly prototypes and high-urgency components – but mostly bought from machine shops and sheet metal houses. I was quite frequently reminded that as many hours as I would put into designing and documenting a part as a design drawing, a vendor would then have to put a similar effort into a production drawing specific to their equipment, run prototypes, then optimize their own workflow so as to balance setups verses delivery schedules. As a smaller outfit, we ended up back of the line and/or buying larger quantities than were ideal at times just to get parts made at all or with a predictable delivery date. Then again, I only heard about the FW3A about two months ago and signed up … yesterday … so I’ve not been anticipating for anywhere near as long as everyone else. Hi. I’m the one who took that picture. I also wrote the code for both the D4S and FW3A. It’s no longer soon-to-be-released; it started shipping a couple weeks ago. I hear Lumintop has CAD files for proto3 though, and is working on manufacturing it. In theory, this is the final sample. So hopefully that can get approved without any further issues and then production can start. Whoa! What is the timeframe for those releases after the FW3A? Sometime before the next manned mission to Mars. They are also doing some special runs for Massdrop in the AA tool and AAA tool configurations. A single emitter for the next version would be great. I’d still prefer 18650 though. Nonetheless, it’s very premature. I’m still looking forward to this one. I think it will be worth the wait.